Since late December 2017, when Forbes published its take on Stellar, its cryptocurrency price has surged, with its market cap has more than doubling from $4.9 billion to today’s $11.5 billion. This rapid growth has led to Stellar’s climb from the 12thcryptocurrency in the world to a pretty impressive single-digit eighth place. Having edged ahead of EOS and NEO in less than a day back then, it is now quickly closing in on NEM and Litecoin, threatening to overtake all competitors on its climb to number 6 on the cryptocurrency exchange. If you are familiar with the technology and development history of Ripple and Stellar, that alone should be enough to give you an insight into the unique philosophies of each cryptocurrency and all the ways in which they are the same, as well as the few differences that exist. Ripple, currently the third largest cryptocurrency according to market capitalization, and Stellar, sitting at number eight, share the same creator – Jed McCaleb. In essence, Stellar is pretty much Ripple, but instead of focusing primarily on enterprises, financial institutions and large transactions, it is designed to cater to and treat all users equally – including individuals and private users, as well as banks and payment networks. What is the purpose of Stellar? With Stellar, there is a strong emphasis on providing equal opportunities. The Stellar Development Foundation is a nonprofit organization that supports the Stellar protocol. On the Foundation’s official website, their stated mission is to “expand access to low-cost financial services to fight poverty and maximize individual potential”, especially in areas and populations that have limited or no access to the services of banks and other financial institutions. As a result, many businesses and nonprofits are choosing to implement this financial infrastructure to extend their business and opportunities to the developing world. Examples include Oradian, a cloud-based company for banking software, which aims to implement the Stellar network in Nigeria, and the Praekelt Foundation, which is working on helping girls in Sub-Saharan Africa save money on expensive telecommunications. As a way to promote financial inclusion, the Stellar Development Foundation rewards grants of up to 2 million dollars in Lumens to partners who develop strategies aimed at banking the unbanked. All of this points to one thing: this is a network with a strong purpose, whose target is to solve a problem that is both very specific and persistent. The growth that Stellar has recently experienced, as well as its precursor, Ripple, could be a sign of a new trend, where more and more users opt for cryptocurrencies that are dedicated to a well-defined cause and have a clear, identifiable application. Such cryptocurrencies feel like a safer bet, since their goal is neither speculative, like replacing fiat currencies, nor opportunistic, focused at leeching off the hype surrounding digital assets. At any rate, the mission-driven, practical approach appears to be working for the project, with no sign of slowing down any time soon. Being designed for a specific purpose means that Stellar relies on a number of concepts that define its mission and establish how it functions compared to other cryptocurrencies on the cryptocurrency market. A distributed Stellar ledger. A distributed or a shared ledger is a record of all the balances and transactions belonging to every account on the network. Relying on consensus, the complete ledger is shared and spread across all servers that run the Stellar software. There are no administrators and no single data storage, meaning that the network is decentralized. Consensus. The mechanism which validates the ledger and makes sure that all entities share the same version of the ledger is known as consensus. To achieve consensus, efficient communication between the network servers is of vital importance. The servers form a list of trusted validators that agree on the validity of each and every transaction and payment that goes through the network. Consensus on the network is achieved approximately every 2-5 seconds. Distributed exchange. This is a key Stellar concept, aimed at creating a global marketplace to buy and sell any currency or asset that has been added to the network. All network users can issue orders, whereby they publicly commit to exchange one type of asset for another at a previously determined rate. Orderbook. All outstanding orders on the network are collected in a record called an orderbook. There is a separate orderbook for every pair of assets, and users can consult the orderbook to monitor what different assets are selling for. Stellar anchors. On the Stellar network, all assets and currencies except its native currency exist as credit. This credit is issued by anchors, trusted entities which act as a bridge between the network and different currencies. Such anchors are not a novelty in and of itself – PayPal is one example that predates Stellar. PayPal issues credit based on deposits from your bank account. All the people with the same anchor – in PayPal’s case, all the people with a PayPal account – can share that credit, i.e. send and receive funds. That credit can then be exchanged for real money by the receiver. The major difference that Stellar introduces is that now there are multiple anchors on the same network, and thanks to the way the network functions, they can all exchange credit between them, not just among users with the same anchor. Stellar’s multi-currency transactions. Since the network operates as a distributed exchange, it is possible to send funds to other people in a currency of your choice, with no conversion or additional waiting time. They can withdraw the funds in their currency through their anchor. The conversion is done automatically, and the system always chooses the best available exchange rate. If there is no outstanding order concerning this particular exchange, the transaction goes through anyway, with Stellar Lumens acting as the intermediary between two currencies. Decentralization. A truly decentralized system is never run from just one source. Such a system is capable of transmitting data throughout a system of servers and associates that function autonomously. The network is conceived in such a way, which means that the system is stable, reliable and secure, even if one or more of its constituents fail. The reliability is very important to potential investors and is one of the key driving factors of Stellar’s success. What are Stellar Lumens and how to get them? Similar to Ripple, Stellar is first and foremost a platform and a network focused on transferring money worldwide as safely and as fast as possible. These low-cost cross-border payments can take as little as 2 seconds to clear, which is even faster than Ripple’s 3,6 seconds. The digital asset (coin) used by the network is called Lumens (XLM) or the Stellar Lumens tokens. The number of Lumens, which were created at launch in 2014, was initially limited to 100 billion, but that number increases by 1% every year. Lumens are the ‘native currency’ or the ‘native asset’ of the network. The term ‘native’ refers to the fact that they do not exist outside the network – they are the network’s own coins. The term ‘native asset’ is thus used to differentiate Stellar Lumens from all other currencies that can be traded and transferred via the network. Of all the currencies there, Lumens are the native currency, and they are used to resolve inefficiencies and to act as a middleman between other local currencies that are not often traded – a concept called multi-currency transactions. It means that you can send money in Stellar coin (XLM), and the receiver can retrieve the funds in his or her local currency, be it dollars, euros or yen. Also, you can pay for products and services abroad without the need to convert the money to a foreign currency. To transfer funds via the network, users must pay a base fee of 0.0001 XLM. The fee is not there for profit, but to prevent attacks on the network – a concerted attack by flooding the network with an enormous number of transactions per second is too impractical and expensive to be pulled off due to the fee, which is redistributed by being added back to the inflation pool. 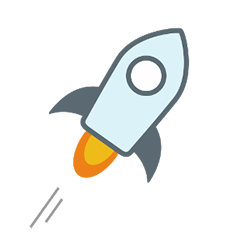 All accounts that are a part of the Stellar network are required to deposit a minimum of 20 coins (XLM) to cover for the potential fees. When it comes to the supply of Stellar Lumens, the developers intend to keep five percent of the total amount to fund projects and operations. Occasionally, some of the funds get auctioned off, while the majority has so far been given away, with 50% going to users who want Stellar Lumens, 25% set aside for nonprofits to reach underserved populations and 20% to Bitcoin holders. Just based on that, it is obvious that Stellar Lumens were not really intended as a speculative asset, where the cryptocurrency price is all that matters. Due to their nature and the way they are used and distributed, for now it seems like there will always be a market for this coin. Coupled with their recent growth, it is easy to see how Stellar Lumens could become even more attractive to investors during 2018. Binance is the cryptocurrency exchange with the greatest market share when it comes to trading Stellar coin (Lumens or XLM). On January 15th, 2018, the trade on Binance accounted for 39,8% of all trade in this cryptocurrency, with the trade volume equaling $43.20 million. On Binance, Stellar Lumens can be exchanged for Binance Coin (BNB), Bitcoin (BTC) and Ethereum (ETH). Other exchanges where it is possible to purchase, sell and trade Stellar coin (XLM) include Bittrex (trading for BTC and ETH, 24.22% market share, $26.74M trade volume), Poloniex (trading for BTC and Tether – USDT, 23.33% market share, $25.75M trade volume), Kraken (trading for BTC, 11.97% market share, $13.21M trade volume), OKEx (trading for BTC, ETH and USDT, 1.32% market share, $1.46M trade volume), Aex (trading for BTC, 0.08% market share, $92,732 trade volume) and BTC38 (trading for CNY, 0.01%, $12.81 trade volume). The current Stellar price, as well as the complete list with every cryptocurrency exchange and updated information can be found over at CoinCodex. To store your shiny new Stellar Lumens, just buying some on a cryptocurrency exchange will not do. To be able to do that, you will first need a Stellar wallet. The Stellar Desktop Client (available on Mac, Linux and Windows) is a common choice. It is an open source Stellar wallet that you can download on your desktop. It has the option of encrypting and storing your secret key locally on your hard drive. Apart from that option, other key features include sending and receiving Lumens within the client, adding known anchors as trusted, buying and selling Lumens, depositing and withdrawing CYN and even creating your own assets. Centaurus: This open source Stellar wallet was the first to become available on Google Play. Also available on iOS. The app is ready to use as soon as you install it, since it automatically designates an address where you can receive funds without any additional fuss. You can spend Lumens just as easily, as well as access already existing accounts on the Stellar network. Supports QR-code scanning, manually pasting addresses, encrypted backups and cross-currency payments. Stargazer: A mobile and desktop wallet, probably the most versatile and the most flexible of the bunch. It supports multiple languages, multiple networks, multiple accounts and, most importantly, multiple assets. Lobstr: A Stellar wallet available as an app for iOS and Android. It can also be accessed via a web app. Simple and user friendly, it has the option of sending and receiving Lumens coupled with a series of other advanced features like its Stellar price converter, support for multiple transactions, anti-fraud measures and e-mail notifications. Ecliptic: With its primary focus on making the most out of Stellar’s distributed exchange, Ecliptic is not only a Stellar Wallet, but also acts as a Trading Client. With Ecliptic, it is possible to add several wallets. In addition to Lumens, you can store other currencies and assets. Using this wallet makes it easy to diversify and connect – with your preferred Stellar anchors, but also (which is a rare option), with other contacts, which can be added to make ID management simpler and easier. Best of all, apart from Stellar’s negligible fees, there are no additional expenses and costs. Among the minor supported wallets, we feel like we should point out Stellar Portal (a web application for managing Stellar accounts), StellarTerm (also a web-based client for trading), Papaya (a user-friendly wallet not only for Stellar Lumens, but other assets as well, including BTC, EURT, LTC and others), BlackWallet (a multiplatform web wallet) and Luuun (a web as well as local mobile wallet based on the Rehive platform). Users who are just now getting familiar with cryptocurrencies, blockchain technology and the cryptocurrency market, are more likely than not drawn towards these topics by Bitcoin’s remarkable success. But not all cryptocurrencies are the same. Every cryptocurrency has a reason why it exists and cannot be simply explained away as Bitcoin with a different name. Stellar in particular is a specialized cryptocurrency. There are several major ways in which this cryptocurrency differs from Bitcoin, and mining is one of them. Stellar is not based on typical blockchain technology. Instead of a blockchain, Stellar uses a distributed ledger. Consequently, there is no need for mining or miners. Just like Ripple, it relies on a consensus algorithm to confirm transactions and validate its distributed ledger. The main reason for this is speed, since using the consensus algorithm means that transactions get confirmed within seconds. With Bitcoin, it can take anywhere between 10-20 minutes to add a new block to the blockchain. Another major difference is the supply of Stellar as opposed to Bitcoin’s supply. Bitcoin’s supply is limited, since the final number of Bitcoin that can be mined is fixed, similar to how the Earth’s supply of gold is finite. On the other hand, the supply of Lumens grows by 1% year-to-year. Also, Stellar’s goal is not to replace other means of payment and take the place currently held by fiat currencies and credit cards. Quite the contrary. Stellar hopes to become a behind-the-scenes currency, facilitating liquidity and trading between other currencies on its own network. Instead of betting on the eventual failure of traditional modes of payment, Stellar is betting on their success – and helping them do their job better is what makes Stellar both attractive and promising. While all of these differences make sense within Stellar’s infrastructure, they are not without their drawbacks. For example, there is one thing that Bitcoin mining does that Stellar’s consensus algorithm cannot do: it provides a comparatively inexpensive way of getting started with Bitcoin – of getting a feel for the world of cryptocurrencies. Also, it is geared towards people who don’t want to be mere investors but would rather take a more proactive approach and invest in the hardware and get their Bitcoins that way. We are not talking about “fee coins” by any stretch of the imagination, since mining requires pretty specific hardware specifications – which means that miners are investing both their hardware resources and their time, not to mention the required level of knowledge and, well, tech savviness. Many feel that an alternative way of getting coins matters, so what is Stellar doing about that? As we have mentioned already, 95% of Stellar Lumens are meant to be simply given away, with one fifth set aside for bitcoin holders, a quarter for non-profit organizations and the unbanked in underserved areas and exactly one half meant for “individuals who want Lumens”. It is exactly this last part that may seem confusing. Why give them away? Also, considering the recent spike in Stellar’s cryptocurrency price, aren’t Lumens worth real, actual money? If so, wouldn’t everyone qualify as “individuals who want Lumens”, i.e. money? To the latter, yes and yes – and all the other questions can be answered if we simply take the time to understand how Stellar works and what it is supposed to do. Its primary purpose is to connect as many people as possible – so, the more people use Stellar, the better off it is. The value that new users bring to the network increases the value of the network and, consequently, the value of the Stellar coin. The initial inflation created by releasing new Stellar Lumens is offset by opportunities for trading and exchanging assets, which strengthens the network. By servicing the underserved, for some people Stellar and its cryptocurrency exchange become their first encounter with the world of finances and financial institutions – and they can start a chain reaction by spreading Stellar throughout their communities and solidifying it as the way of doing things when it comes to payments, money transfers and exchanging assets. It is also important to note that Stellar Lumens are not all given away at once, since that would devalue the cryptocurrency price and crash the market. Instead, they are given away in smaller increments – a process which will take approximately 10 years to complete. During that time, giving Lumens away will result in more influence, a bigger reach and better utility, benefiting the whole network, including those who choose to spend money and invest in Stellar. Stellar’s growth, although impressive, is just one piece of the puzzle. If we are to see the bigger picture, we must consider it within the context of a larger trend, driven by the increased public interest in cryptocurrencies in general. More than anything, this interest has been propelled by the sheer gravitational pull of Bitcoin’s remarkable success. However, the consummate mass of Bitcoin means that it turns much more slowly than some of the smaller bodies orbiting it – and, as investors are now finding out, some of these smaller cryptocurrencies harbour ecosystems that are much more fertile and have the potential for explosive growth. Stellar Lumens are among these smaller celestial bodies on the bright sky of the cryptocurrency market. Both new investors looking for fast returns, as well as old investors looking to redistribute some of their gains are now turning their gaze towards Stellar and other prospective giants. And rightfully so: with Bitcoin’s growth consistently in the single digits per day throughout December, the Stellar price doubling in two days’ time is certainly looking attractive. Such growth, combined with Stellar’s purpose and its successful application as an efficient way to transfer value and funds across borders and across different assets, has not gone unnoticed. In fact, Stellar has drawn the gaze of major industry giants such as IBM and KickEx, who signed a partnership deal with Stellar back in October. Deals like that help to instil confidence in the success of the cryptocurrency in the average user who is just now getting familiar with the concept of digital assets. The increased confidence is the biggest factor contributing towards the growth of Stellar coin, catapulting it on a path to success. But if you want more cryptocurrencies to choose from, remember that we have a vast collection of articles just like this one. So, go ahead and explore this website to learn all about the cryptocurrency market. Looking for a way to get a high return on your investments? Learn everything about Stellar and find out why this is the perfect investment target. A must-read.